But often we don't realize how much Jesus' last day should change our present, too. To some extent, every good Christian book you read is about the cross of Christ. The difference with "Passion" by Mike McKinley is that it is deeply personal. It fully brought home that Christ bled and died FOR ME and that he did this because he LOVES ME. Every time I feel a bit spiritually dry, or burdened by serving, or wearied by life in general, I read a chapter of "Passion" (any will do) and my heart is flooded with thankful praise. The reminder of what MY Jesus, MY Saviour did for me casts a totally different perspective on the day ahead and enables me to live it differently. This book is a delight to read and keeps you joyfully remembering the cross for days. The chapters are short, as the author takes small chunks of the build up to the crucifixion in Luke and explains them, then applies them in a gospel centred way. This is the kind of good food - gracious truth - that helps a new Christian to understand the cross by, an older Christian to be focused by, and an unbeliever to learn Jesus by. The cross of Jesus is everything. It is eternity changing, world changing, death changing, life changing..... or least it should be! 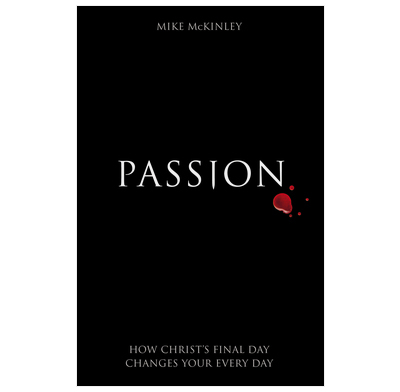 The subtitle of this book puts it: “How Christ’s final day changes your every day.” In this excellent book Mike McKinley, a pastor in Virginia, takes us through the last hours of Jesus Christ leading up to his death on the cross from Luke’s gospel. As the subtitle suggests there is also careful application and each chapter ends with helpful questions for reflection. It is devotional writing at its best and fittingly each chapter ends with an appropriate hymn. Reading this book, a chapter a day led me to understand more of Christ’s passion and gave me a fresh passion to live to boast only in the cross. As someone, who has only really and truly embraced Christianity, and I'm in my 70th year! I found "Passion" to be an exiting and concentrating account of the final day of our Lord. I have always relished historical facts and these coupled with the book following Luke's gospel helped me enormously to understand the time frame of events. Well written, quite easy to follow and fully recommended. It tells very clearly about Christ''s final days on Earth. It is written so clearly that even non-Christians will be able to understand Christ's final days on earth. This book is easy to read and one that is difficult to put down. It is the most concise and challenging book on the cross that I have read. So much so, that I changed our Lent house group programme to get people reading it. As other reviewers have said - this is a book suitable for almost anyone.